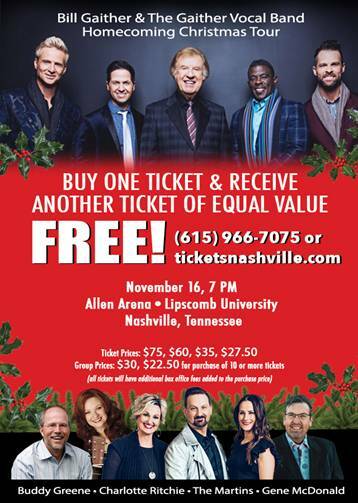 Multi-Grammy Award winning recording artist, Bill Gaither will present the Gaither Christmas Homecoming music spectacular at Lipscomb University in Nashville, TN, on Friday, November 16, 2018. The legendary recording artist will present an exciting celebration, filled with the very best in Christian music, including Gaither’s own multi-award winning group, The Gaither Vocal Band. Other artists include: Buddy Greene, Charlotte Ritchie, The Martins and Gene McDonald. This special event will begin at 7:00pm. For nearly half a century, multiple Grammy and Dove award winner Bill Gaither has been a musical trailblazer. His reputation as a performer, songwriter and mentor for newly-discovered artists is known world-wide. Gaither’s beloved series of Homecoming CDs and DVDs continues to top the sales charts and attract an ever-increasing audience. Whether you are a brand new fan or a longtime lover of feel-good Gospel music, don’t miss this incredible concert experience. "In times like these we must reflect on what is most important in our lives...faith, family and friends," explains Gaither. "I invite everyone to join me and my special ‘friends’ for an uplifting musical extravaganza filled with joy, laughter, good music and great memories." This festive evening will feature many classic Christmas favorites, allowing all those attending to experience the true Reason for the Christmas season.